Reflections Around the Campfire: I'll Bet You Never Took a Shower at a Flying J! I'll Bet You Never Took a Shower at a Flying J! Please note that this post depicts our family’s experience with Flying J and Pilot travel plazas. We like them and make a conscious effort to do business with them, but I am not affiliated with them in any way and I am not earning any type of compensation from this post. Last year, Alan and I, along with our 18 year old daughter, traveled cross country for nearly six weeks on our family’s third cross country National Parks camping trip. Our son, who is now 23, “aged out” several years ago due to full time employment. (Yes, this makes me very sad.) This trip was, most likely, the last time our daughter would be able to road trip with us (and yes, this makes me very sad, too). We packed up shortly after her high school graduation and hit the road. You may recall from previous posts that Alan and I prefer campgrounds in State and National Parks for the space and solitude they provide, as well as the opportunity to wake up surrounded by the forest or perched on a lakeshore. One of the disadvantages to this preference of ours is that many of these campgrounds provide no water, electric or sewer hookups and so we often end up “dry camping” without services. Those of you who are familiar with dry camping know that water conservation is usually a top priority. Although we do travel with a portable waste tote in the event that we have to empty our black and/or grey water tanks while dry camping, we find that we can extend our stay at a campground to about a week without having to do that - as long as we take brief showers and limit dishwashing. Anyone who has children of the female, teenage variety knows that “brief shower” and “teenage daughter” are phrases that just don’t fit well together. Although our daughter is extremely cooperative, her long, curly hair is difficult to wash well during a “military” shower. Twice during last summer’s trip we stopped at a Flying J so that she could take a l-o-n-g, h-o-t s-h-o-w-e-r. This was our first experience with the showers at a truck stop and I thought you might be interested to learn how the process works. Since our daughter was the only one who used the showers, the description of the shower rooms is based upon the details she related to us. Let’s just say she was quite pleased with the Flying J! Her first shower experience was at the Flying J in Ripon, California, followed several weeks later by the second at the Flying J in Roberts, Wisconsin. 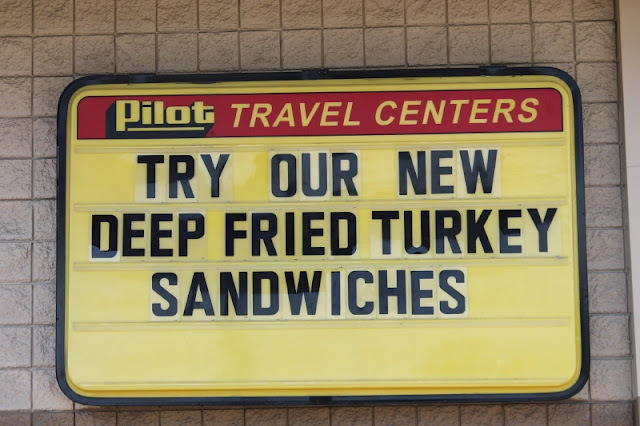 Flying J’s and their companion stations – Pilots – are travel centers (or travel plazas) operated by Pilot Travel Centers, LLC, based in Knoxville, Tennessee. 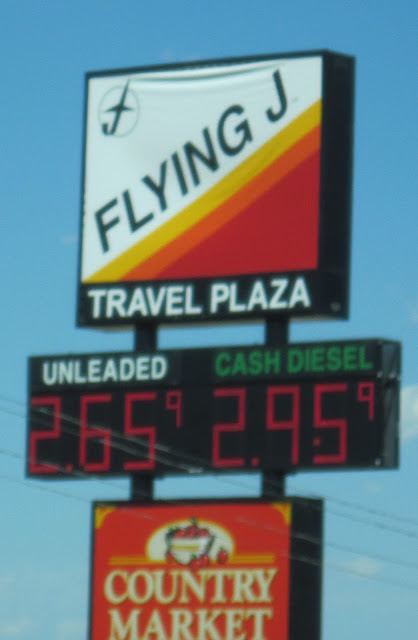 According to the company web site, Pilot Flying J is the largest operator of travel centers in North America with more than 750 locations in 43 states and 6 Canadian provinces. They serve more than 1.3 million guests per day. Fans of Warren Buffett may be interested to know that Berkshire Hathaway owns a minority percentage of this privately held company – and no, that was not investing advice! Visit the Pilot Flying J web site (link HERE) to learn more about the company or to locate a travel center when you’re on the road. Alternately, you may want to ask for a copy of the “RV Location Guide” the next time you stop at a Flying J or Pilot. The guide lists all locations in both the U.S. and Canada and indicates which travel centers have RV facilities and services. We carry one with us whenever we travel. At the registers, we explained to the cashier that this was our first shower experience and we asked how the process worked. Here’s the scoop: You pay $12.00 for a shower. Wait! Before you get all worked up about the high cost of a shower, just listen to this . . . You are given a receipt with a number and a key code on it. When your number is called, you go to the appropriate shower room and enter the key code on your receipt on the key pad to unlock the door. (“Professional Driver #54, your shower is now ready. Please proceed to Shower #9.”) You have full use of your shower room for one hour. Family members are each allowed a turn in the shower room; you simply have to notify the shower attendant that this is your plan. So, actually, all three of us could have had a 20 minute shower for the single price of $12.00. If you haven’t vacated the shower within an hour and a half, the shower room attendant will knock on the door, checking to be sure you’re all right. The room itself is well designed with two separate areas – the shower, of course, and the sink/dressing area where your clothes and personal belongings remain completely dry while you shower. There is plenty of hot water and a supply of clean towels, plus the mirror over the sink even has a fan blowing on it to keep it “fog-free.” I’m sure that’s a huge help to any professional drivers who need to shave or put on makeup. Hey! There are women drivers, too, you know! Once a shower room is vacated, the shower attendant will clean it then open it up in the queue for the next driver – who, by the way, might have already reserved a shower via the myPilot app! While our daughter was taking advantage of the shower facilities, Alan and I waited in the “truckers’ lounge,” watching TV (Alan) and using the free Wi-Fi (me). So, while $12.00 initially seemed like a high price for a shower, the length of time you could use the shower room, the cleanliness of it and the professional way this traveling chore is handled at the Flying J made it worthwhile to us. As for having a smiling, cheerful teenager . . . well, that’s just priceless! Flying J’s and Pilots are familiarly known as truck stops but are actually called travel centers. I guess somebody, somewhere thought that sounded better than “truck stop.” Since this particular Flying J had 197 parking spaces for trucks with quite a number of them taken, I think I’ll stick with truck stop. However, the reasonable gas prices, fresh coffee and snacks seem to draw not just truckers, but many automobile drivers and RVers, as well. Most locations offer the kind of quick meals you’d find at a convenience store (um, thanks, but I’ll pass), and many locations that don’t offer an actual sit down restaurant like Denny’s often have a fast food franchise such as a Subway or McDonald’s on the premises. Not hungry right now - thanks, anyway! But here’s the best news: If you’re a Good Sam member, you can save 5¢ per gallon on gas or 8¢ per gallon on diesel at most Flying J’s and Pilots in the U.S. and 1¢ per liter on gas or diesel in Canada. Additionally, you can save 5¢ per gallon on propane and $2.50 on dump station fees (that’s 25% off their $10.00 dump fee). Discounts make my frugal heart happy! Our experience at Flying J made such a positive impression that now, when I’m in a Pilot or Flying J and hear the announcement, “Professional drivers, there is currently no wait for a shower,” I just have to text our daughter to let her know. Okay, so go ahead and admit it – you didn’t think I could write a post this long about taking a shower at a truck stop, did you? Thanks for stopping by – and please do come visit again soon. You just never know what the topic of conversation is going to be! For my fellow wordsmith, I offer this thought: A sparrow may utter a thousand chirps over little more than a found piece of bread. And the other sparrows will eagerly listen if a scrap or two may fall their way. And such is the case here: I never gave much thought to showers at truck stops, but your mention of the fuel discount is something I had forgotten. That becomes quite meaningful when pumping a hundred gallons of diesel. So chirp away, my friend; you never know who may find one of your scraps. My frugal heart was happy to be of help, Mike. One of the favorite expressions in our household is "better in our pocket than theirs." If we're entitled to a discount, we try to take full advantage of it. Thanks for the heads up on Flying J & Pilots! We traded in our Jeep while on vacation for a diesel Jeep so we will be using them on our way home to use our Sam’s Club discount. Always happy to help our camping buddies save a little money. Travel safely! By the way, most people buy souvenirs on vacation, not Jeeps! I Learned a New Word - "Anthropomorphic!"